SARAL PAYPACKis a complete payroll solution empowering companies with best of the payroll management toolsand features bundled into a single package. 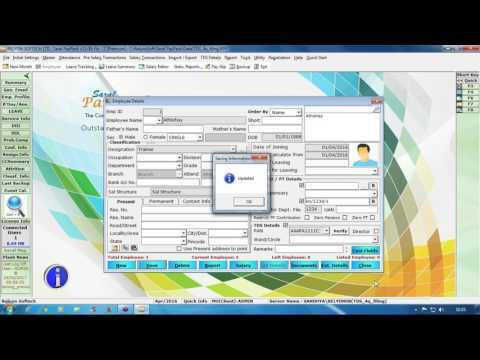 Entire Payroll operations ranging from capturing the employee records and attendance to payslip generation, all processes with accurate calculations can be performed automatically within this cutting edge software solution. The software is one of its kinds to ESI computations mapped to Indian Labor Laws. This most user-friendly solution highly contributes to effective management and enhanced performance of the Payroll department. Relyon is a creative blend of highly talented individuals who constantly working together with their expertise knowledge to uphold the significance of RELYON. Relyon has its presence in almost all the segments of industry. This is mainly because of the flexibility in Solutions provided to suit the requirement. Relyon has reached more than thousands of desktops in every part of country. Powerful Reporting tool: All types of reports with ready to use data, providing insight into information on payroll process in different formats Department Formats: Electronic upload reports are available in the department specified format with direct upload to department website Tailored Reports: Saral PayPack provide flexibility to design and customize the report as per the requirement any number of times MIS Reports: Detailed MIS reports on related various different of employees pay process like HR, Leave and Attendance etc. Leave Management: Streamline the employee leave with the leave policies. Automate the leave allotment process based on periodic, month, half yearly or annually. Track all the leave transaction of the employee and update the leave balance. Customized Leave Policies: Saral PayPack Cloud provides flexibility in setting up the leave policy as per the organization need. The leave policies can be customized which includes various information like leave carry forward, apply leave in advance etc. Information Management: Employees can update and manage their personal information and work related information. Leave and attendance can be managed by viewing the details on the portal and a report on the details can be taken. Request & Declaration submission: The employee can apply for leave through their ESS login in advance. The reimbursement claim can be updated through the ESS login. To benefit employee tax planning, declaration on tax saving can be submitted. Gratuity is a retirement benefit given by an employer to an employee. It is paid for employees at the time of leaving, as a gratitude for the service employee has rendered, provided that the employee has served the company for more than 5 years. Gratuity is paid for a retiring employee as well as the employee who is leaving after completing 5 years of service in a company. Employees’ state Insurance Scheme of India is a multidimensional social system tailored to provide socio-economic protection to worker population and their dependents covered under the scheme. Besides full medical care for self and dependents, which is admissible from day one of insurable employment, insured persons are also entitled to a variety of case benefits in times of physical distress due to sickness, temporary or permanent disablement etc. resulting in loss of earning capacity, the confinement in respect of insured women, dependents of insured persons who die in industrial accidents or because of employment injury or occupational hazard are entitled to a monthly pension called the dependents benefit. At an average the ESI Corporation makes 40 lakh individual payments each year amounting to about Rs.300 crores through its wide spread network of branch Offices in the implemented areas. For availing cash benefit in different contingencies insured persons or their dependents have to complete some minimal formalities and follow certain set procedures. Employee State Insurance was introduced to provide certain medical benefits to employees in case of sickness, maternity and employment injury and to make provisions for related matters. As the name suggests, it is basically an ‘insurance’ scheme i.e. employee gets benefits if he is sick or disabled. Q. What is Code Number? It is a 17 digit unique identification number allotted to each of the factory/establishment registered under the provisions of the Act. Such a number is generated through ESIC portal on submission of the pertinent information by the employer or generated on receipt of Survey report from the Social Security Officer.